Russia’s Jenna Cordonnier sets during a Shelby County Athletic League match on Tuesday in Botkins. Cordonnier broke Russia’s single-game and career assists records last week. 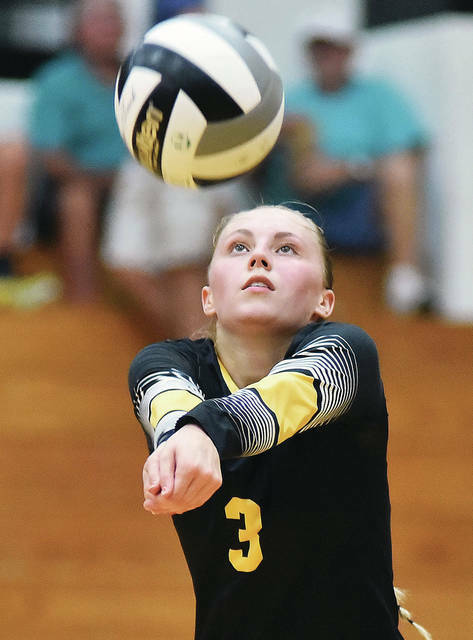 Botkins’ Janell Greve gets under the ball during a Shelby County Athletic League match against Russia on Tuesday in Botkins. Greve had eight kills in the match. 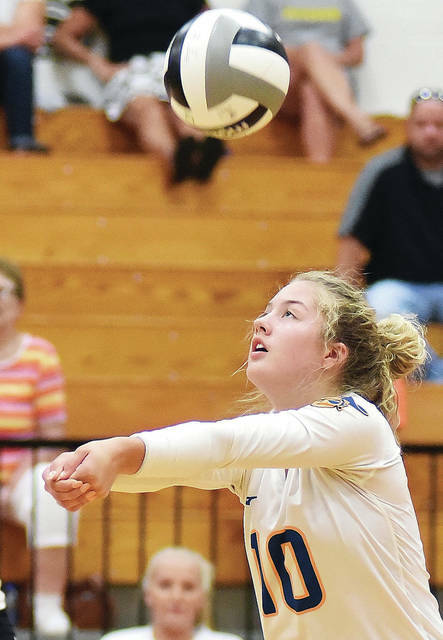 Russia’s Ashley Scott gets under the ball during a Shelby County Athletic League match on Tuesday in Botkins. Scott is second on the team with 96 kills. Botkins' Meg Russell gets under the ball during a Shelby County Athletic League match on Tuesday in Botkins. Botkins' Paige Doseck dives for a ball during a Shelby County Athletic League match on Tuesday in Botkins. Russia's Laurissa Poling blocks during a Shelby County Athletic League match on Tuesday in Botkins. BOTKINS — Russia’s volleyball team didn’t come out of a tough nine-match slate at the start of the season unscathed, but what it learned may help when tournament play starts in October. And if the lessons from the first nine matches didn’t stick, a refresher in the second game against Botkins on Tuesday should make them stick like hot gum on shoe soles. 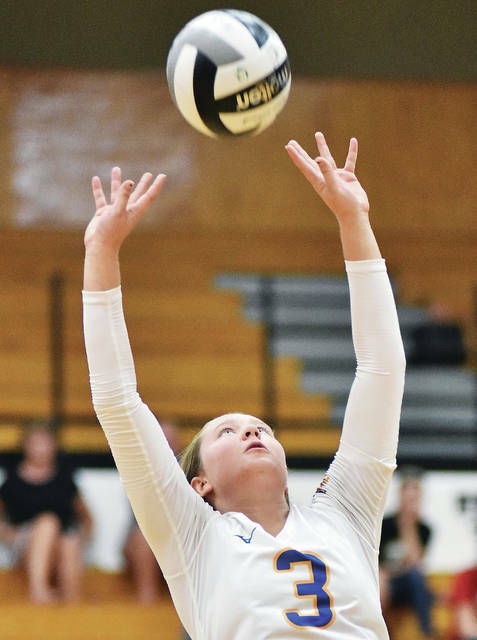 Russia beat Botkins 25-8, 25-22 and 25-4 in a Shelby County Athletic League match on Tuesday to improve to 6-4 overall. The Raiders dominated the first match but played sluggishly in the second and struggled to return balls. Botkins took advantage and jumped out to a 13-7 lead. The Raiders scored the next eight points to re-take control for good and cruised to an easy win in the third set. After two close 3-2 losses in the first week of the season, Russia had a six-day stretch any area volleyball team would be happy with. 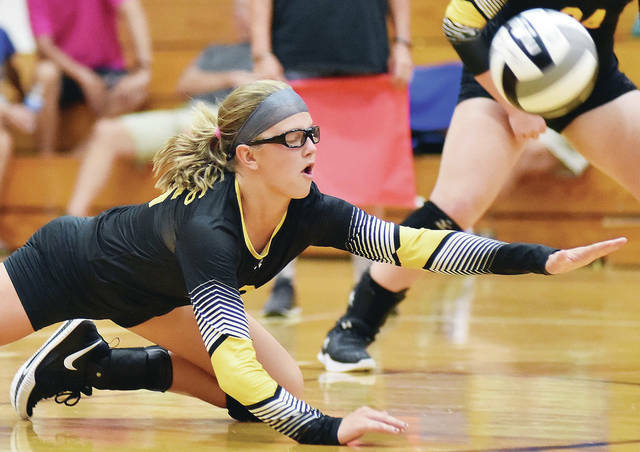 The Raiders lost to New Bremen and Jackson Center — who combined have won the last three Division IV state titles — by 3-2 scores on Aug. 21 and 23. They then beat rival and defending Div. III state champion Versailles 3-0 on Aug. 25 and followed with 3-2 wins over SCAL rivals Fort Loramie and Anna. 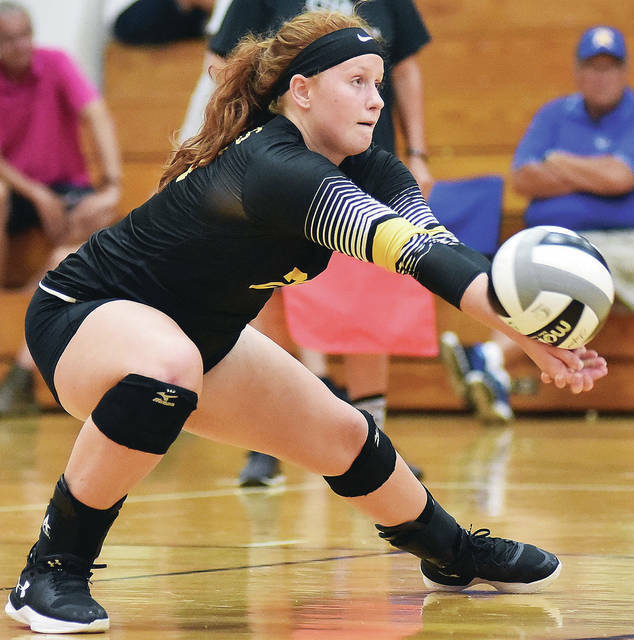 Russia lost in two sets to St. Henry and Fort Recovery in St. Henry’s invitational last Saturday and then earned a 2-0 win over Buckeye Central, which was a state semifinalist last year. “To come out through that 5-4, I’m pretty happy with that actually,” Russia coach Aaron Watkins said. “Saturday wasn’t the best day. We came out sloppy and played ugly, kind of like today, but overall I’m happy. 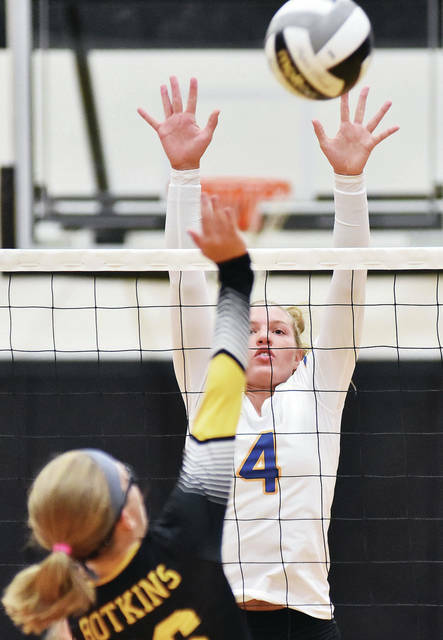 Russia, which won a district title last year, has one of the area’s best combos at the net with senior middle hitter Laurissa Poling and sophomore outside hitter Ashley Scott. Poling leads Russia with 103 kills and 36 total blocks this year. Poling, a 6-foot-2 senior, was first team all-SCAL selection last year. Russia isn’t relying on Poling for all its offense, though. Scott has 96 kills and 23 aces and has added 20 blocks to help the Raiders defensively. Watkins said Scott was slow to adjust from junior high as a freshman but had a breakout Club season last spring. Cordonnier said Scott had helped improve Russia’s scoring ability. Senior outside hitter Morgan Wenrick has 43 kills and junior outside hitter Jessica York has 32 kills and 19 blocks. “We’re really able to spread the ball out, so it’s nice having all those options at the net,” Watkins said. Sophomore libero Kendall Monnin leads the Raiders with 152 digs while Cordonnier has 102. Cordonnier also the leads the team with 252 assists. She broke Russia’s single-game assists record with 56 in a 3-2 win over Anna last Thursday. Cordonnier also set the school’s career assists record at St. Henry’s invitational on Saturday. After Tuesday’s match, she has 1,605 career assists. Russia is tied with Anna for second place in the SCAL while Jackson Center is in first. Cordonnier said the Raiders have to improve to be able to win the league. “We’re definitely going to have to communicate better and run our offense quicker because a lot of teams are starting to figure out our offense,” Cordonnier said. Poling led Russia with 10 kills and five digs against Botkins while Scott had nine kills and four digs and Wenrick had five kills. Cordonnier had 27 assists and seven digs while Monnin had nine digs and three aces. Botkins dropped to 1-5 with the loss and 0-3 in SCAL play. Bella Ewry and Brielle Boroff had nine assists while Janell Greve had eight kills and Paige Doseck had seven digs. Botkins’ Meg Russell gets under the ball during a Shelby County Athletic League match on Tuesday in Botkins. Botkins’ Paige Doseck dives for a ball during a Shelby County Athletic League match on Tuesday in Botkins. Russia’s Laurissa Poling blocks during a Shelby County Athletic League match on Tuesday in Botkins.